Awhile back, I posted about 7 money making apps, and Swagbucks is one of them! Swagbucks is my favorite way to make money online. I’ve used this site to make over $250, and while that doesn’t sound like much, it’s $250 more than I would’ve had otherwise! I like to cash out for Amazon or Starbucks gift cards, and I haven’t paid out of pocket for my Starbucks since signing up for Swagbucks! There are many similar sites for earning for doing tasks like watching videos and taking surveys to make money online, but I personally like Swagbucks because they’ve given out almost $200 million, yes MILLION, in gift cards and rewards, which is way more than most other companies. I also like them because of the variety of ways you can make money, compared to other sites that rely solely on surveys. With Swagbucks, you can earn points called Swagbucks (or SB, where 100 SB =$1, redeemable for gift cards) for searching the web, shopping online via cash back, and watching short videos. This way, I can still make a few Swagbucks with just a few minutes a day, when I don’t have the time to answer surveys. 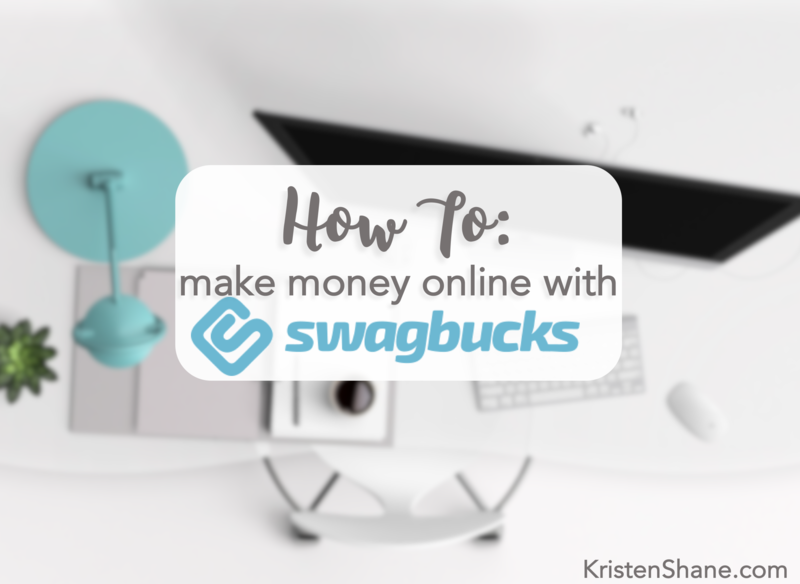 Because of all the different ways you can earn Swagbucks, it’s pretty confusing and overwhelming at first, so I wanted to do a post going through the basics, along with some of my personal tips for making the most of your time! If you choose to sign up for Swagbucks, you can do so through my referral link here. This is at no cost to you, and we actually both get a bonus when you sign up! Of course, you don’t have to use my link, but it’d sure be nice if you did! This is what your Swagbucks page looks like once you set up your account. It’s overwhelming at first, and there a lot of different ways to earn Swagbucks (or “SB”, where 100 SB = $1). The pink circle shows all the different ways to earn. I always check Swagbucks and Ebates to check for cash back before shopping online. On Swagbucks, I earn most of my SB from “Discover” and “Answer”. You also have the ability to earn 4-15 SB through just searching the web using the Swagbucks search bar! You won’t win every time you search, but I try to use this feature a few times a day, and at least win once every other day. Here’s some of the other basics of the site. 1. Daily Goal: Swagbucks gives you bonuses for meeting daily goals of earned SB, usually ranging from 30-50 SB, and the bonuses are about a 10% of the goal. For example, if you daily goal is 50 SB and you earn 50+ SB that day, you get 5 SB bonus at the end of the month. Once you hit the first daily goal, there’s a larger, second goal, that also gives a bigger bonus! On average, I made 15-100 SB bonus each month, really just depending on the amount I earned that month. 2. Inbox: Here, you’ll receive a bunch of daily special offers. They’re basically ads, so I mostly ignore and delete them, but sometimes there are easy earns. 3. Your total SB! This is the motivation. From here, you can access your account, your gift cards, and a whole menu of other actions. 4. Most popular ways to earn: This is a good place to start! I’m not sure how these offers are formulated, but these offers are usually good. There’s a mix of all types of offers here, but these surveys are often good ones too. 5. To Do List: Your to-do list is an easy map for daily earning. Here, you’ll find the Daily Poll (a random survey question that gives you 1 SB for answering), Daily Crave (a few short videos that give 1-2 SB), the Daily Deal (just click and open for 1 SB), among other things. If you complete at least 5 out of the 7 items on the list, you get bonus SB! Here’s your “Answer” page. The surveys can be frustrating because you won’t qualify for all of them. Think about it though, each survey has their own target demographic, so naturally you won’t qualify for all of them. That means that you might spend a couple minutes answering preliminary questions and then be kicked out for not qualifying… But, all the surveys without the ‘i’ (circled in pink), at least give you 1 SB for trying. The “time to complete” are just estimates, and I often finish faster than these times. 50-75 SB isn’t much for the time it takes to do surveys, but it does add up, and the reward for doing one survey is (almost always) enough to meet your daily goal! Also, the circle on the left shows the “Peanut Lab Surveys”, which are shorter surveys and usually have a payout of 50 SB or less. If you scroll down on your main page, you’ll find this bar of “popular videos”. I like to do the “Take a Discovery Break” and open the window in the corner of my screen while I do surveys or other things on my computer. This specific offer takes 1-3 minutes and can be repeated multiple times per day. I hope this run-down was helpful for you to learn how to make money online with Swagbucks! Like I said, I make most of my SB through surveys and cash back from online shopping. But the smaller offers, like videos and search, really do add up! I’ve saved around $30 from online shopping alone, which is a big bonus since it’s all things I would’ve bought anyway, in addition to using Ebates! Swagbucks won’t earn you enough money to be considered an income by any means, but it is great for making a little money without leaving your couch! If you have any questions, or if you decide to sign up for Swagbucks, I’d love to hear from you in the comments! 🙂 Thanks for reading, and happy earning! Thanks for this overview! I’ve used Swagbucks off and on for awhile and recently earned my first gift card. It is pretty overwhelming, so I appreciate the tips! That’s so exciting! I love when I finally get enough for a gift card 🙂 glad you enjoyed my tips! I m earning some money from Clixsense and looking for another way to earn money from home. Today I will try for Swagbucks. I love swagbucks!!!! I’ve used it to get all our spending $$$ for Disney! That’s such a great use of the extra money, I love that! !